Double and stitched 5/8" high quality bridle leather with solid brass hardware to match the Tennessean saddle line. 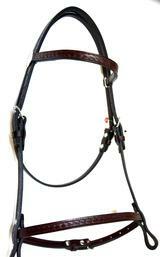 This bridle has a unique bit attachment system that is easy and simple like no other. Reins and bit not included.